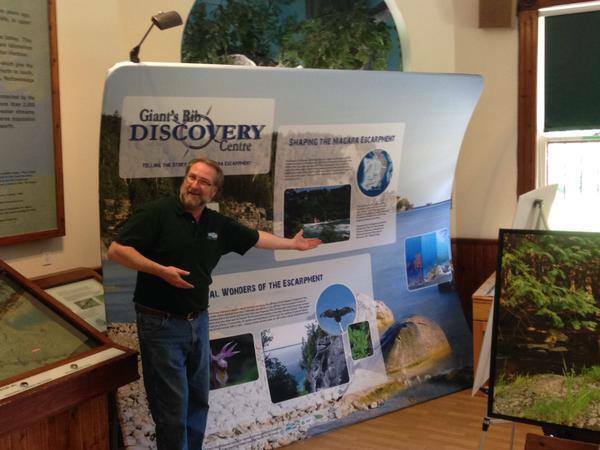 The Giant’s Rib Escarpment Education Network (GREEN) has just unveiled its Discovery Centre 2 Go! This lightweight portable display is a travelling Giant’s Rib Discovery Centre, complete with fossils and digital display screen. As part of GREEN’s improvement and expansion initiatives, this portable display can travel around the province, telling people the story of the Niagara Escarpment. The digital screen can display not only GREEN educational videos, but can feature host information and promotion as well. We are seeking interpretive centres, conservation areas, national or provincial parks or other facilities along the Niagara Escarpment to host the display for a time, and that the display can make its way up and down the Rib. 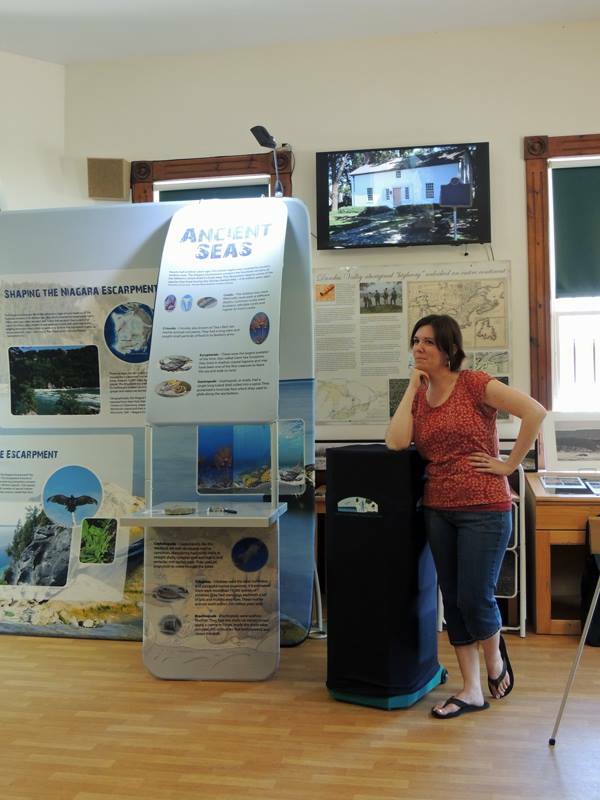 With new visual resources at our main Discovery Centre in Dundas, and with this travelling display, we’re seeking partners to share our resources with, providing consistent NEBR education information along the length of the Escarpment. 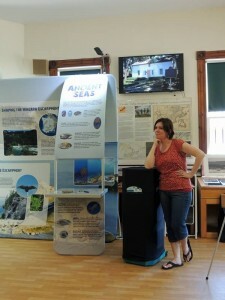 GREEN Director of ROM programs, Cindy Marr, shows off how even the carrying case can act as a podium! Potential partners interested in creating new interpretive information about the Escarpment on their sites should contact us. We’re willing to work with you to use our resources or develop new products specific to your site. This could include wall panels, portable displays or digital media. GREEN’s improvements to the Dundas Centre are nearing completion. The goal of the expansion project is to establish a series of small “Discovery Centres”, providing more visitors with important and current information about Ontario’s amazing Niagara Escarpment. Want a Niagara Escarpment Display? Drop us a line!